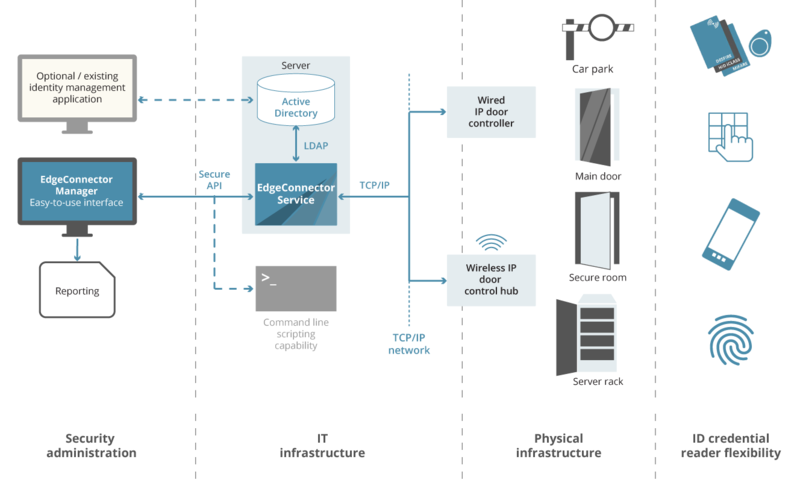 The unique design of the EdgeConnector solution takes the power and flexibility of pre-existing IT access management systems, such as Microsoft Active Directory, and extends that to encompass IP network connected doors and other physical access controls. All sites and staff on the network are automatically covered as standard, and any number of doors can be added as needed. Access through doors is controlled in real-time by the same decision-making that governs access to IT resources. There’s no separate IT infrastructure for handling door access control, no additional databases for managing physical access permissions, and no duplication of employee identity information. The EdgeConnector Service typically runs on an existing Active Directory domain controller, located in-house or cloud-based, and processes door access requests from door controllers and hubs in real-time. Any changes to access permission are immediately effective at every door. EdgeConnector Manager is included to provide a secure, easy-to-use, interface for the delegated management of users, visitors, doors and schedules by non-IT staff; without compromising directory security. Alternatively, other identity management applications running off Active Directory may be used for day-to-day administration tasks. EdgeConnector’s secure open standards design means it can also integrate easily with other applications. Our standards-based approach extends to the types of identity credentials that can be used. RFID contactless cards and fobs of various technologies are supported, ranging from125kHz Prox and 13.56MHz MIFARE Classic to the most secure iCLASS, SEOS and DESFire standards, any of which can be combined with PKI-based IT access credentials in the same ID-card. Biometric, pin-pad and NFC/BLE phone credential readers can also be used with EdgeConnector. Any number of doors, located anywhere across any number of network connected sites, can be controlled through any combination of compatible wireless and wired IP door control devices.